The Power Crystal overall is my favorite turkey call. It is the one call on which I can make the whole spectrum of turkey sounds well. It purrs like a dream. It cutts and yelps from soft to VERY LOUD, it clucks beautifully. 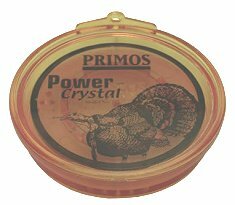 For close or hands-free work I still prefer my mouth calls the best, but for an all-around call that makes all sounds really well, the Power Crystal does it for me. It's got the most volume of any friction style call I've ever tried, and I've tried a few. But it can also be really soft. I do have to say one negative thing about the Power Crystal. Primos advertises is as 100% waterproof with the Carbon striker included in the package. I did not find this to be the case. I got the call wet on purpose and tried the Carbon striker and got no sounds. The Power Crystal does everything else so well, though, I'm willing to forgive it on this count. I've got other calls that I can use when it's wet out. POST-SCRIPT: When we say that we tested these calls, we mean that we TESTED them, in the field.